"Thank you so much for your email, received your book 'The Need for Balance'. Feeling fantastic. "Wow, the adjustments to life have been huge but I'm pretty happy with where I'm at now. I talk to other people experiencing this condition and even after a year they explained they were still in a train wreck and can't get over how I've come so far. Thank you for the assistance with this crazy condition. "Managing Menieres came along exactly when I needed it most. It's been like a miracle. Something I would recommend to anyone. "Your earlier book [Managing Meniere's Disease] was the best resource I found when I began seriously researching the causes and possible treatments for my menieres (after having been treated terribly by the medical profession for a long time.) I’ve had it for 40 years and I’m 69, so we’re talking staying alive! Again, thanks so much for all your research and help and for making it available at a price I can afford. The last flare left me deep in debt. "Thanks for this new book! I really enjoyed the last one. Keep up the good work my Friend. You speak the truth which is rare, but extremely helpful! "I would like to take a moment to thank you for doing all you do to educate and support everyone. You have been instrumental in steering the ship back on course. You are a blessing to us who had lost hope and for the first time can now begin to move forward toward health and happiness once again. I loved the way the book flowed. It was so easy to read and the print size was perfect..short paragraphs..nice flow all the way. Again, congratulations on the book! It will be immensely helpful and comforting to dispel a lot of fears amongst the sufferers....wish only more could find the courage to think for themselves. "I got no help from my GP and was told nothing could be done and I would have to live with it! Usual scenario from them. Thankfully I haven't had an episode of vertigo for nearly 3 years now. "Thanks for all your help you do for us Menieres patients. I have purchased and read your book and found it a great resource. "It is very good. The dots are now connecting with me. I'm interested in your other book as well and will check your website. "Many thanks Mike.Rita is feeling much better thanks to you. "Thanks Mike; read the whole book here at work (Ha). Good job; stuff in there I never saw before!! "I bought your 1st book and learned a lot from it. Symptom free for about a year and a half. "I read every word carefully, and find it a light bulb moment. Thank you for your research, and passing it on for desperate single moms as myself to gain back life and function. of the causes that may be causing my menieres. "This is great that you are promoting the book to help people with Meneire’s disease. I do not have this disease anymore!! Keep up your great work and pray for Meneire’s Disease to go away for everyone. "I have spent the last 2 days reading your book! The information has been very helpful and I understand and look at Meniere's in a different light now. I feel like it all makes sense! "Greetings from Cairo. I have just finished reading your book. Full of good information. Thank you! "Thank you for your very informative, encouraging book. "Thank you for following up, again…I do appreciate it. After reading your book so far I have seen improvement. My hearing has cleared up some in both ears. The “fog” I was living with has subsided and my tinnitus has decreased as well. Earlier this year my hearing was so bad that I was unable to hear the fan that is placed right next to my head at night. For years I have not been able to speak on the phone with my right ear and now I am able to. Finally, THANK YOU, THANK YOU, THANK YOU, for having and maintaining your web site and your book. I have already referred it to a couple of people who I have met that are going through the same problems. You definitely opened my eyes to alternative options for dealing with these issues, other than the Dr’s telling me to “learn to live with it”, or having to take the potentially toxic medications they were prescribing me. Thanks again for your help. I can't express my appreciation enough! "I just wanted to congratulate you on the completion of your book. As a fellow Meniere’s sufferer, I sincerely appreciate people like you doing extensive research and publishing what works and what doesn't work. More of us need to be solution minded, instead of having a victim mentality. Two years ago, I was literally a mess. I thought my career was over, I thought my life was over. At this time, I have the (vertigo and brain fog) symptoms about 98% under control. In any case, just wanted to say kudos for sharing your information. It's great for an MM sufferer to have hope that they can conquer this awful disease. "My husband is now living symptom free. "First, thank you for your terrific book! You have done incredible research and provide a wonderful guide. 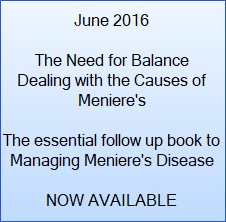 We are quite knowledgeable re Meniere’s from Jeff’s experience with this wretched disease diagnosed in 1997. We are so enthusiastic re your work and grateful for your help and the terrific book! "I have been suffering with Meniere's for over 12 years. Now my head is clear, I have energy, and my vision has returned to normal. I got up on Saturday and walked over to the window. I was in awe that there was so much color outside. It was like I was seeing beautiful color for the first time. And the brain fog had lifted. This is honestly better than I imagined I would feel so soon but I feel fantastic. I have boundless energy and found myself actually laughing and feeling playful like my old self. It's been a long, rough road but I am truly hopeful of living with fewer and/or less intense episodes for the first time since my initial diagnosis. "Just read your book that was given to me for Christmas by my husband. Thank you. I have no criticism! Great Book full of things all Meniere's people need to know. I am going to re-read it! Thank you so much for sharing your experiences and knowledge! Look forward to receiving more. "Just wanted to let you know that I read your book and was surprised at the amount of information you have made available. My mother has been very lucky, her Meniere has been cured. I wish you much success in helping people from this terrible disease. "Thank you Mike. All of my symptoms have gone away. "Great news as I'm sure you knew there would have been! I Haven't had any symptoms of dizziness or vertigo since February. The ringing sensation I always had in my ears has almost gone, most days it is not there at all. The fullness of the inner ear that I usually experienced has reduced also and again some days it isn't there at all. All round I feel great, my lifestyle has improved, I have more energy feeling less tired than I did, my immune system has got a real boost, I no longer seem to suffer from the continuous colds/snuffly feeling that I had before. I was getting really frustrated and feeling really low about the menieres and could not see a light at the end of the tunnel. The ENT specialist I am under did not give me any hope of how to reduce my symptoms etc and just said that Menieres is something that I needed to get used to and just live with. That's a load of rubbish and I cannot wait to see my specialist next and tell him that. I cannot thank you enough for your advice and help. Please keep up the good work. My life really has improved in the last few months and Menieres disease is now in the background locked away, hopefully for good. People should not have to suffer from the disease as it can be managed and not just by pumping your body full of chemicals such as serc (that hardly work at all anyway). "Thank you for your continued support. I learned so much from your book and have been living free of almost all symptoms ( I have a very slight tinnitus still) for over a year now. I can't wait to read The Need for Balance. I have recommended the first book to all my friends in our group. Thank you again. You gave me the confidence and knowledge to change my life around when I was ready to give up.